I asked barely the same question in [url=http://solar-flux.forumotion.com/t961-equilibrum-temperature]this topic[url], but now it's more precise. I'm making a new website using PHP. I want a website who can generate a raw identity card using the EPE downloadable data. Not just a replication of EPE, but an identity card like John Whatmough's, with predicted equilibrium temperature and appearance. -Sudarsky's classification need to know the albedo, but we don't know this data for all exoplanets. So, can I have a "sudarsky's like classification" using only orbital and star's parameters? -Can we include pM and pL spectra planets in this classification? When my new website will be complete, I hope some of you will translate it in others languages. Re: A Sudarsky's like classification for my website? Problem with including pM and pL classification is that the planets don't always seem to abide by the temperature-based rule that determines where they should go. A few planets that you'd expect to be pM end up being pL, and a few you'd expect to be pL end up being pM. So, is the Sudarsky's classification obsolete? Not sure. Really the only planets we've had to test with are Sudarsky Class IV and V. And so far, all of the planets have been really varied. 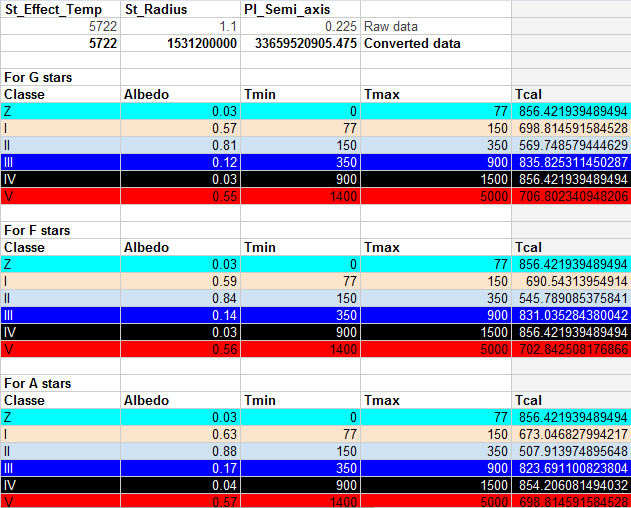 This is the only thing i can do with Sudarsky's classification and EPE data: I have to calculate the equilibrum temperature with all albedos of I to V classes (+ Z type for zero) and spectral classes of stars from G to A, then compare this temperature with min/max of each class. But it's doesn't work all the time. Nobody answered... I try again. For each sudarsky class (plus my "Z" class for zero) and each stellar spectral type, we have the albedo of the planet, the minimum and the maximum temperature. So, for each planet, I can calculate the equilibrum temperature with each albedo and then look if it fit between the minimum and maximum values. But there is a problem. Between two sudarsky class, you have an area where nor the previous, nor the next sudarsky class fit, or the two at the same time. For example: around our sun, there is an area of 0.66 AU (it's a lot...) where both II and III are possible. The T_eq fit in both [T_min, T_max] of class II and [T_min, T_max] of class III. In another hand, there is an area of 1.6 AU (!!!) between classes I and II where a class I exoplanet will be hotter than T_max for class I, and a class II exoplanet will be cooler than T_min for class II. What should i do in this situatons? Create new classes, something like John Whatmough's 55 Cancri c rendering? I think the underlying problem is not knowing the intrinsic parameters of the planet such as its albedo. You might consider a transition class, where the atmosphere is Class III along the equator and Class II near the poles, for example. But I don't know if there's really a "right" answer. According to wiki, it was published before any direct/indirect observation of extrasolar planets were known. I think the classification is obsolete. This classification does not take into consideration if the gas giant is carbon-rich or not. that has a major effect on what the planet may look and the temperature. Another example, is if the planet is hydrogen-poor. If hydrogen-poor, it is not venting as much and would be much hotter than a hydrogen-rich which is venting hydrogen.